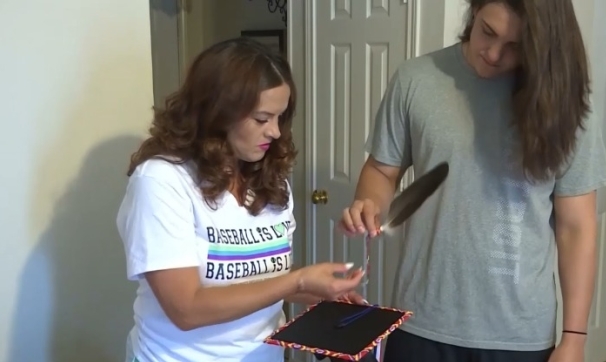 A mother of a Midway High School senior says her sons graduation was ruined when school administration stopped him from walking across the stage while honoring sacred Native American traditions. With his football experience and fairly clean record, Tacoda Goodall could be described as an all-American kid. "I'm good. I make pretty good grades and everything," he says. He’s also Native American. He wears his hair long. In his culture, it represents his flow of thoughts, and is only cut during major life changes, like a high school graduation. “I've always told him be proud of who you are,” says his mother Charity Goodall-Smith. Tacoda grew up in the Midway Independent School District. His mother has gotten letters from the Chief of the Cherokee tribe so his long hair-which is against dress code- would be allowed at school. The letter she says she submitted in September also mentions the cultural and religious beliefs requiring Tacoda to wear an eagle feather and beaded cap and tassel at graduation in May. “This is a big deal for me and for my family- for my culture,” says his mother. "I only get to do this a few times in his life." She says she's spent two years arranging permits and blessings of the feather which should only be handled by someone in the tribe. She also says she received a voicemail confirmation from the school that the embellishments would be allowed. With a new symbolic haircut on the big day, Tacoda, was ready to walk across the stage. 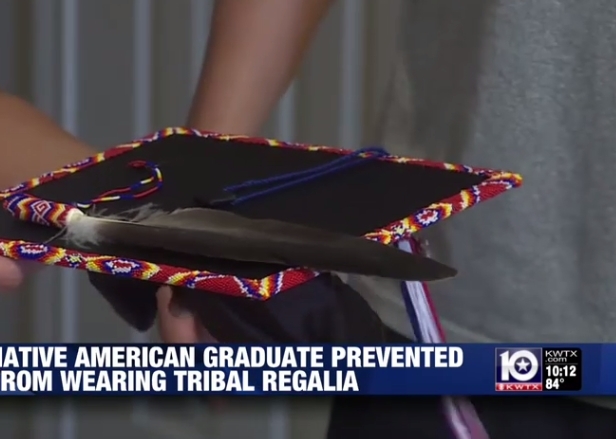 But minutes before the ceremony, he says he was stopped by an assistant principal and told to he couldn’t receive his diploma in his native garb. “It just kind of hurt a little bit," says Tacoda. Tacoda says he was given a plain cap to wear, and his sacred feather was handed off to a stranger who worked for the cap and gown distribution company. “Everything I did to try to prepare my son for this one day was thrown away in a second,” says Tacoda's mom. In a statement the district apologized for any confusion due to miscommunication and said they’re determining if graduation dress code requirements need changing. Tacoda’s mother says they also offered a re-enactment so that her son could take new graduation photos, but she would rather see changes in policies that disregard their beliefs. "I can never get that day back," she says. "I just want to take a stand- I don't want this happening again." Responses to "Cherokee student not allowed to wear Native American regalia for graduation "
So wrong! They shouldn't have touched his feather, and they should have allowed him to go across with his original cap. What are the schools rules did she know this might happen. ?